President Trump and his top advisers are talking a big game about how American natural gas can help Europe lessen its dependence on Russian gas. But the administration is running into some big obstacles, like cheap fuel prices and a pair of Russia-backed pipeline projects. Why it matters: Exporting America's bounty of natural gas to Central and Eastern European nations has emerged over the last few weeks as a key part of Trump's energy and foreign policies. But the administration's influence in this area is limited, and the president faces risk of backlash if he goes too far in pushing American natural gas over other nations' resources. Russian gas is cheaper than American gas, and that isn't likely to change any time soon because it's expensive to liquefy U.S. natural gas so companies can ship it around the world. This dynamic is keeping Russia as the dominant gas supplier to many parts of Europe. Leading up to and during Trump's trip to Poland last week, he and his administration made much fanfare about a state-owned Polish company's first purchase of American natural gas, received in June. But this was a one-off purchase and not a long-term contract. That's like buying a guest pass to a gym instead of signing up for a more permanent membership: It feels nice in the moment, but it doesn't do anything to change the bigger picture. A spokesperson for the Polish gas company, PGNiG, said in an email to Axios that its long-term contract with Gazprom expires in 2022, and that it doesn't comment on its long-term contracting plans. Gazprom didn't return requests for comment. While many U.S. firms are poised to export natural gas, Cheniere Energy is currently the only American company currently exporting the fuel in a liquefied form. Of Cheniere's roughly 140 deliveries since last year, 13% of them have gone to Europe, according to the company, most of that to Western European nations. No long-term contracts have yet been inked between American firms and energy companies in Eastern and Central Europe, a region most dependent upon Russian gas that has in the past seen its fuel supplies temporarily cut off amid tension with its neighbor. These trends are due almost entirely to price considerations. 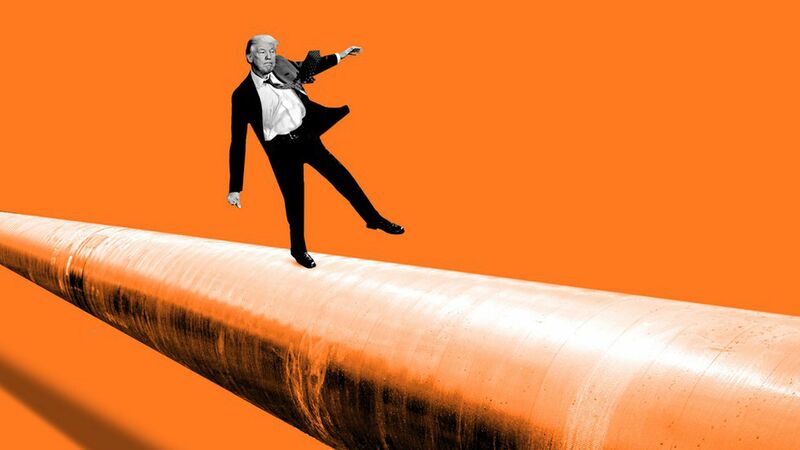 "Liquefied natural gas -- due to the high costs of liquefaction, shipping and regasification -- is hard pressed to compete against Russian pipeline gas on a cost basis," said David Koranyi, a director at the Atlantic Council who was in Poland for Trump's visit. Koranyi said Russia makes money at $4 to $5 per 1 million British thermal units, while U.S. companies need closer to $7 or $8 to recoup their fixed costs. A pair of pipeline projects that would funnel even more Russian gas to Eastern and Central Europe are in the works. If built, they would exacerbate obstacle 1 for American natural-gas companies by making Russian gas even more available and comparatively cheaper. The Obama administration was opposed to both projects: Nord Stream 2 and TurkStream going beyond Turkey. Top Trump administration officials have maintained a similar position, despite Trump's friendly relationship with Russian President Vladimir Putin. The U.S. government has no direct control over deciding the fates of these pipelines, but the Senate recently passed a bill on broader Russian sanctions that allows the Treasury Department to levy sanctions on investment in Russian pipelines built to export natural gas. If Trump signs a bill with that provision, it could have a chilling effect on backing for those projects. Some European officials are worried that Trump is pushing American natural-gas exports in Europe purely to benefit American companies, as opposed to encouraging Europe to wean itself off of Russian gas, according to interviews with multiple experts in touch with European officials. "That impression, valid or not, could backfire, if Europeans start to see U.S. LNG [liquefied natural gas] as just another politicized fuel source," said Tim Boersma, a natural-gas expert at Columbia University's Center on Global Energy Policy. Boersma said that when he traveled with a trade delegation of mostly Germans in Russia a few weeks ago, some of the German officials said the United States was opposed to the Nord Stream 2 pipeline mainly because it would eat into a potential market for U.S. companies. A senior government official acknowledged that perception exists but pushed back on it, saying instead that American natural-gas exports can be a win for both the United States and Europe. Trump himself addressed this head-on while speaking in Poland, indicating the concern has reached the top within the administration. "Let me be very clear about one crucial point," Trump said in Warsaw on July 6. "The United States will never use energy to coerce your nations, and we cannot allow others to do so."